Yay! Finally got my card done :) For today's fabby sketch I grabbed some Reverse Confettie stamps & dies AND I got to play with my NEW Stitched Circle Stax!!!!!!!! Remember the Holiday Coffee Lovers Blog Hop? Well Holly was giving away some blog candy and I WON those Stitched Stax!!!!!!!!!!!!! They've been on my wish list FORever!!!! Thanks Holly :) I inverted the sketch and added a little banner at the top, I am so in love with this You Make Me Smile set from RC... I love the sentiments and I LOVE the way they are broken up! Below is this week's amazing sketch, and now it's time to check out what the rest of the Deconstructed Sketch Girls did with this week's sketch! DS167, It's a Good Day to be Happy! What a perfect card this is for my day! I got my hair did, which always makes a girl feel happy! Then we had the most fabulous "Family Dinner" night. Since DD moved out we've designated one night a week as "Family Dinner" night, and it's certainly starting off to be a great new tradition ;) For today's card I combined Jen's fabulous sketch with some MFT goodies... LOVE the simplicity of this card and those colors are just too fun! I'm working on a table runner and quilt in these same colors... yummy!!! Check out the sketch, then drool over the DS Girl's samples then go forth and be stampy!! Oh and Happy Friday-eve!! 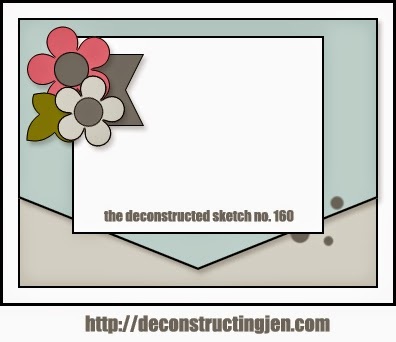 MFT Sponsors this week's Deconstructed Sketch! Happy Friday-eve! For today's sketch I went a little overboard... it seriously isn't my fault, I mean the package of goodies MFT sent us was PHENOMinal!! I mean I looked at the goodies to think about what to use and I couldn't make up my mind so I made a variety :) All 3 cards use the sketch, yet all 3 have their own personality :) LOVE it! This one is my favorite so let's peek at this one first. I used Dienamics Blueprints #19 for the "Easel" and stamped the sentiment from CS Birthday Chalkboard Greetings in my brand new Teal ink pad (isn't it gorgeous?!?!). I colored this adorable Pure Innocence Happy Banner with Copics and added some White Sharie Paint pen polka dots on her dress. I punched out some hearts for the top corner. For my second card I used the Dienamics Blueprints #19 to make an Easel card. The banners on the top are also from the Blueprints. I stamped "everything" from the Happy Everything stamp set and then used the Dienamics Happy die. The happy word is popped up. This card is going in the "hubby pile"!! This card also uses the Happy Everything stamp set and the Dienamics Happy die. The dies to make the bow are from the Dienamics Blueprints #19. I stamped the "totally" from Happy Everything set in a Weathered Wood distress ink and also in Sky Blue ink. The "happy" is popped up and so is the bow. Sooooooo LOVING my goodies package, thank you so much MFT!!!! Create a card using DS160. Upload it to your blog, Pinterest, Flickr, Splitcoaststampers or other online gallery. Link your project back here in InLinks by July 23, 2014 at midnight CST. The winner will be announce on Friday July 25, 2014. Happy Tuesday :) Here's another of those calendar pages I recently finished up for my Mommy. Sorry for the quick post! Hope you have a fabulous week and thanks for stopping by! I'll be back soon with my Seize the Sketch post! Super quick post because I can't believe I forgot to post this calendar page... shame on me!! First off let me say YAY! Typepad is back up, and I sooooo appreciate all the time, effort and communication they provided!! Oh yes, and the douche-canoes that spend their time launching attacks like that should be taken out behind the barn and BEATEN! Ok, rant over :) A couple of years ago I made THIS CALENDAR for my Mom, well for reasons that I will NOT go in to (for sheer embarrasment) I needed to make her a few more pages recently. For her calendar (to see all of her Calendar pages, click on my CALENDAR category at the end of this post) I used the PI Calendar girls from MFT Stamps... they are soooo stinking cute and really do just fit my Mom to a T. This is her January page... LOVE those colors!! For those of you that have followed a theme with a homemade calendar what company/line of stamps did you use? While to do LOVE MFT's PI's... I think this has inspired me to make a couple of calendars for the house :) Thanks for stopping by, hope to see you again soon! MFT PI Calendar catch up! I can't believe how much catching up I have to do and how far behind I got over summer! And to think we didn't even get to go away!! :( I do just love these Pure Innocence girls, so cute to color!! Woo hoo! I finally got to play with another MFT sketch :) Last week's sketch was an uber fun one! I also used one of MFT's rolled flowers that I haven't used before... Royal Rose, but I realized that I think I have every rolled flower die MFT makes BUT NOT A SINGLE LEAF DIE!! Seriously?!?!?!?!? How did that happen?? Needless to say, these Royal Leaves are now on my Wish List! I also think I need more of these Vertical Greetings... #2 looks like fun (and maybe MFT will be making more... pretty please?). I used some felt for my flower... I just LOVE that look! and of course I just had to add a button to the middle :) Did you know MFT carries buttons?!? I am over the moon and can't wait to collect all of their colors... cause a girl can never have enough buttons! Ok, I have a not-so-little cutie bug waiting to snuggle and read, so that's all I've got for ya for now. Thanks for stopping by, hope to see ya again soon! Is this just ink and girly and fun or what?? Yes I know, it's July and nearly August... I can't believe I never posted this page. I just adore it!! This is another page for my Mommy's calendar. I'll be posting her July and August calendar pages later this week. Here is the May page for Mom's calendar. I think this one may be my favorite!! I used last weeks MFT WSC sketch and the colors are from the Ribbon Carousels inspiration challenge. Have you visited the Ribbon Carousel store? Of course you have, I'm always the last one to find out about awesome places!! lol. They have AMAZING ribbons, like the striped green ribbon I used here, LOVE that ribbon!!! They tons of other fun goodies too, so you really need to pop over and check them out. Be sure to visit my Calendar creatin' friends (see below). The MFT DT has challenged everyone to make a Teacher's Gift, and here's mine :) First I picked up a big box of crayons, the 64 count box and used them to cover a rectangle box... I had 2 crayons left over, lol. I wrapped some ribbon around the whole thing and added the sentiment from Big Greetings, by MFT. I picked up an African Violet... and voila, a super fun planter for the teacher's desk! For the card I made to go with this gift, I used the Girls Rule set and last week's MFTWSC sketch. Well that's all I have for now, I'll be back shortly with a peek from My Time Made Easy's May release! Thanks for stopping by. Be sure to visit my calendar buddies to see their April pages if you haven't already.